The 2018 Women’s March just occured on Saturday and the ever growing platforms of the MeToo and Time’s Up movements, many wondered whether the 2018 SAG awards would follow suit with The Golden Globes sea of actresses in all black and memorable calls to action. Color returned to the red carpet and prominent Times Up pins were moved to places like clutches but the sentiment was still there. And then there were some actresses that still slayed, dressed in all black. Yara, we are looking at you, in fact, you’re the reason we made this list! 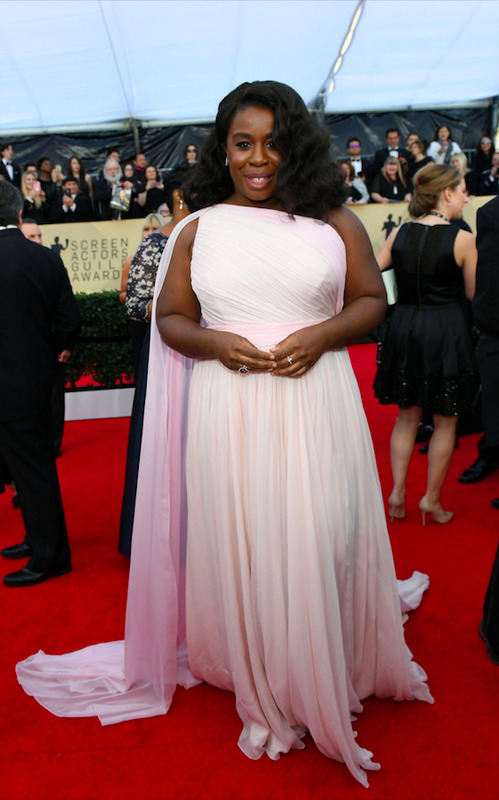 Here are our Fluff Faves for the SAG Awards. Let's start with our favorite of the evening, Blackish / Grownish shining star Yara Shahidi in a black custom suit by Ralph Lauren. Halle Berry stuns in Pamella Roland. This woman seriously just glows! Margot Robbie in Miu Miu. Chic, modern, but yet, timeless. Let's take a moment for how cute and age appropriate Milly Bobby Brown is in her converse with custom Calvin Klein. Danielle Brooks channels old Hollywood glam in Marc Bouwer and beautiful finger waves. Also in white Ralph & Russo Allison Williams mixing old Hollywood glam with modern necklines. Oh Mary Mary! WOW. Mary J. Blige looks incredible in Jean-Louis Sabaj. We're all seeing her in new light as a celebrated actress. It has been quite the past few months for Lupita, sharing her harrowing MeToo tale with the New York Times. Strength has never looks so elegant. Lupita Nyong’o wears Ralph & Russo.